When the city of Putrajaya was conceived as Malaysia’s administrative capital back in the late 1990s, the master-plan included a diplomatic quarter where it was intended that foreign nations would relocate their embassies, consulates and high commissions from their current locations in Kuala Lumpur. 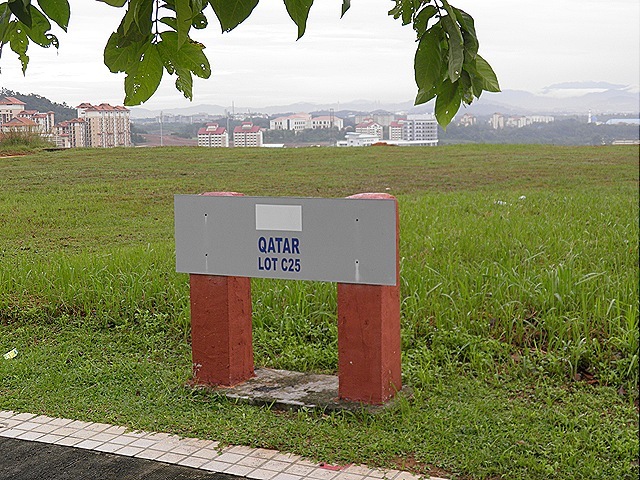 Putrajaya’s Precinct 15 was earmarked for this purpose – a pleasant area of rolling hills providing fine views over the city. The site was cleared, roads laid out with street lamps, signage, pedestrian crossings and so on. 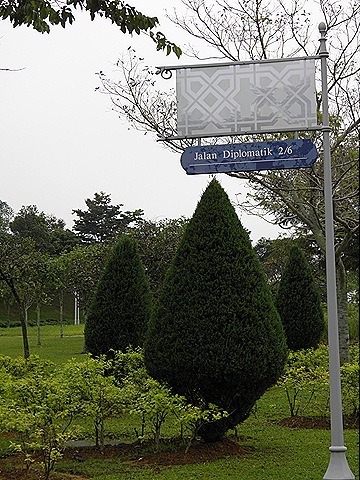 The area was beautifully landscaped with trees and tropical plants and small parks were created so that diplomats’ drivers could doze in the shade while waiting to take their bosses to their next appointment. 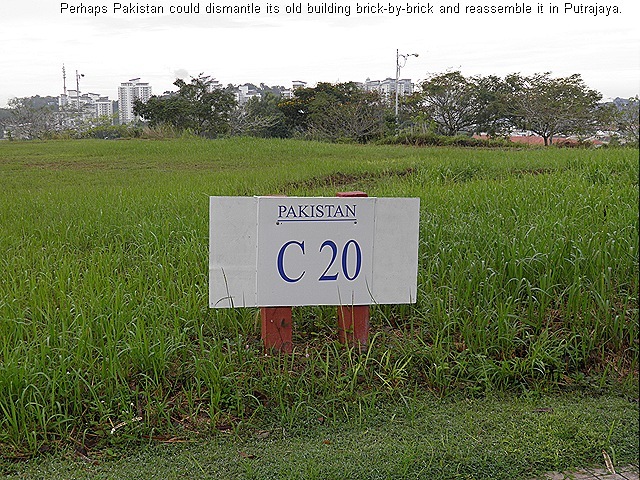 Plots for embassies and residences were allocated and signs put up marking their locations. That was several years ago when suddenly, in the words of Monty Python, nothing happened. There was no rush of construction and no flood of diplomats’ children applying for Putrajaya’s only international school, Nexus. 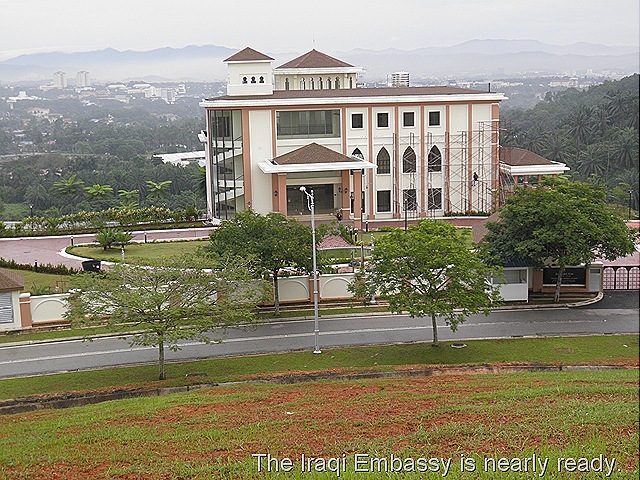 I have been living here for two and a half years and still the Iraqi Embassy is the only one which has been built and I don’t think even that one is occupied yet. Putrajaya Municipality’s website says ‘The heart of the Putrajaya Diplomatic Precinct is its mixed use town centre, which includes retail outlets, restaurants, residential terrace villas, shopping, dining and entertainment outlets, which allow the diplomatic community to intermingle with the locals.’ The mixed use town centre has been built, and quite nicely too, but the shopkeepers there are still waiting for the opportunity to sell to the diplomatic community. Why is this? 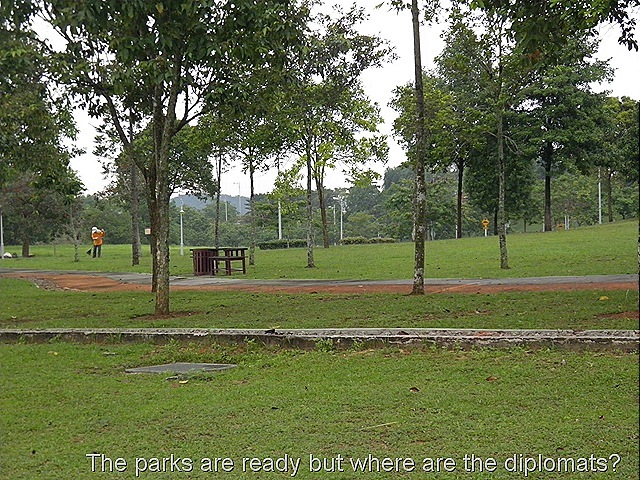 Probably inertia coupled with the perception that Putrajaya, being a new city, does not have all the facilities and amenities that diplomatic families are used to in KL. That may be partially true but Putrajaya’s facilities have improved a lot and it is a very nice place to live and its only half an hour’s drive from downtown KL. It is also where the Government has all its ministries including the Ministry of Foreign Affairs so diplomats would save a lot of commuting if they lived nearby. 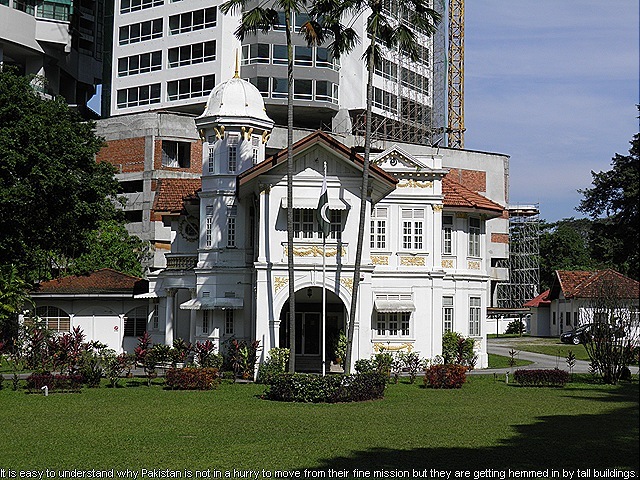 The Malaysian government has been more than patient but how to persuade foreign embassies to relocate to Putrajaya without twisting arms which is probably not Malaysia’s preferred style? My suggestion is that Malaysia should revise the system of issuing Diplomatic car number plates by allocating country code number 1 to the first country to relocate its mission to Putrajaya and number 2 to the second country and so on. This might seem a petty matter, but to the diplomatic world it’s a big deal. Britain for example would be most miffed if it were about to lose its prestigious number 1 code (if indeed it is number 1). Perhaps this might start some frantic relocations to Putrajaya.